Buddhology is the study of the Buddha or Buddhahood. The term is also used as a synonym for Buddhist Studies, contemporary academic investigation of Buddhism. There are varied and nuanced understandings of the precise nature of a Buddha expressed in the different Buddhist traditions and movements. Theravada Buddhists base their view of the Buddha on the Pali Canon, which appear to be the oldest surviving Buddhist scriptures. From the accounts contained in the Pali Canon emerges the view that Buddha was a human being — a perfected human being. Buddha was also possessed of all the various supernatural powers, and mastered these to the greatest extent possible (Digha Nikaya 11: Kevatta Sutta). The body and mind of a Buddha (while alive) are impermanent and changing, just like the body and mind of ordinary people. A Buddha does recognize the unchanging nature of the Dharma, which is an eternal principle, and an unconditioned and timeless phenomenon. When Buddha died at the age of 80, his body and mind both came to an end. After death, the state of Buddha is undefinable (MN 22). However, a Buddha definitely does not experience rebirth after death, but experiences the attainment of Parinibbana (the ultimate Nirvana). There is thus an end to the life-continuity of rebirths succeeding one another (this is one of the meanings of samsara). In Theravada, a Buddha is not regarded as a god nor as having created the universe or ruling over it. Theravada Buddhism interprets the statement by Buddha that "whoever sees the Dharma sees me (that is; the Buddha)" in the context of the whole conversation which the Buddha held on that occasion. The goal of this teaching was to make clear that the physical body of the Buddha is not the essence of his being, and that seeing his body doesn't tell you much about him at all. Even when one is sitting next to him, if one doesn't know his teaching (or sees the truth he discovered: Dharma), one is really far from him. But when one sees the Dharma, even if one is very far away, it is as if one is very close to him, because one really sees what Buddhahood is about. According to the Theravada tradition, the context of the teaching thus does not support any claim for the Buddha to have meant that his existence is God-like (permanent, unchanging, timeless), which is how this sentence is sometimes interpreted in Mahayana Buddhism. Buddhas are devoid of all impurities (anāsrava) and mundane qualities. Buddhas preach the Dharma with every verbal utterance they make. Buddhas can express all elements of the Dharma by uttering a single sound. The supernatural powers (prabhāva) of Buddhas are unlimited. The longevity of Buddhas is unlimited. Buddhas reply to questions without the need for reflection. Buddhas never actually utter any words since they abide in eternal samādhi or meditative concentration, but beings perceive words to have been uttered. Buddhas understand all things with one momentary thought. Buddhas know all things because insight or prajñā is conjoined to that one momentary thought. The knowledge of cessation and of non-arising in the future are sustained continuously in Buddhas until they enter parinirvāna. 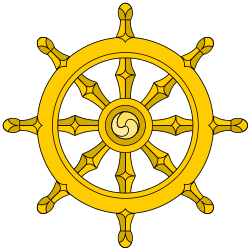 There are Buddhas dwelling in all directions of the compass. An important doctrine that flourished during the middle period of the unfolding of the Mahayana - and is still important today amongst certain Mahayana schools of Buddhism - is that of the Buddha's immortality and eternity. The idea of an eternal Buddha is a notion popularly associated with the Mahayana scripture, the Lotus Sutra, which was written down about 500 years after Shakyamuni`s preaching of it.. The Lotus Sutra has the Buddha indicating that he became awakened countless, immeasurable, inconceivable trillions of aeons ("kalpas") ago and that his lifetime is "forever existing and immortal". The sutra itself, however, does not directly employ the phrase "eternal Buddha"; yet similar notions are found in other Mahayana scriptures, notably the Mahaparinirvana Sutra, which presents the Buddha as the ultimately real, eternal ("nitya"/ "śāśvata"), unchanging, blissful, pure Self (Atman) who, as the Dharmakaya, knows of no beginning or end. The notion of an eternal Buddha perhaps finds resonance with the earlier idea of eternal Dharma/Nirvana, of which the Buddha is said to be an embodiment. While Theravada Buddhism holds back from stating that the Buddha is eternal and emphasises all-round impermanence, some expressions of Mahayana Buddhism, however, regard such an understanding as incomplete. The Tathagatagarbha sutras provide an allegedly culminational doctrine of a pure Selfhood (the eternal yet ungraspable hypostasis of the Buddha) which no longer generates karma and which subsists eternally in the realm of Nirvana, from which sphere help to suffering worldly beings can be sent forth in the forms of various transitory physical Buddhas ("nirmānakāyas"). While the bodies of these corporeal Buddhas are subject to disease, decline and death - like all impermanent things - the salvational Tathagata or Dharmakaya behind them is forever free from impairment, impermanence and mortality. It is this transcendent yet immanent Dharmakaya-Buddha which is taught in certain major Mahayana sutras to be immutable and eternal and is intimately linked with Dharma itself. According to the Mahayana Mahaparinirvana Sutra, worldly beings fail to see this eternality of the Buddha and his Dharma. The Buddha declares in that latter Mahayana sutra, which presents itself as the last and most definitive of all sutras: "I say that those who do not know that the Tathagata [Buddha] is eternal are the foremost of the congenitally blind." Buddha-nature (Classical Chinese: 佛性, modern pinyin fó xìng, literally corresponds to the Sanskrit, Buddha-dhatu - "Buddha Element", "Buddha-Principle", but seems to have been used most frequently to translate the Sanskrit Tathāgata-garbha, meaning "Buddha Matrix", which would be more directly translated into Chinese as 如来蔵) is a doctrine important for many schools of Mahayana Buddhism. The Buddha Nature or Buddha Principle (Buddha-dhatu) is taught to be a truly real, but internally hidden immortal potency or element within the purest depths of the mind, present in all sentient beings, for awakening and becoming a Buddha. The Trikaya doctrine (Sanskrit, literally "Three bodies or personalities"; 三身 Chinese: Sānshén, Japanese: sanjin) is an important Buddhist teaching both on the nature of reality, and what a Buddha is. By the 4th century CE the trikaya doctrine had assumed its current form. Briefly the doctrine says that a Buddha has three kayas or bodies: the nirmanakaya or created body which manifests in time and space; the sambhogakaya or body of mutual enjoyment which is an archetypal manifestation; and the Dharmakaya or reality body which embodies the very principle of enlightenment and knows no limits or boundaries. In the view of Anuyoga, the 'Mindstream' (Sanskrit: citta santana) is the 'continuity' (Sanskrit: santana; Wylie: rgyud) that links the Trikaya. The Trikaya, as a triune, is symbolised by the Gankyil. ↑ "buddhology." Webster's New Millennium Dictionary of English, Preview Edition (v 0.9.7). Lexico Publishing Group, LLC. 09 Sep. 2008. <Dictionary.com http://dictionary.reference.com/browse/buddhology>. ↑ Japanese Association of Indian and Buddhist Studies, "Summary of the Activities of the Japanese Association of Indian and Buddhist Studies"